The health benefits of cayenne are truly astounding! From its heart-protective qualities to boosting the immune system, it will even stop bleeding from a cut or wound! In this article we are going to look at one of cayenne’s many benefits: easing pain. 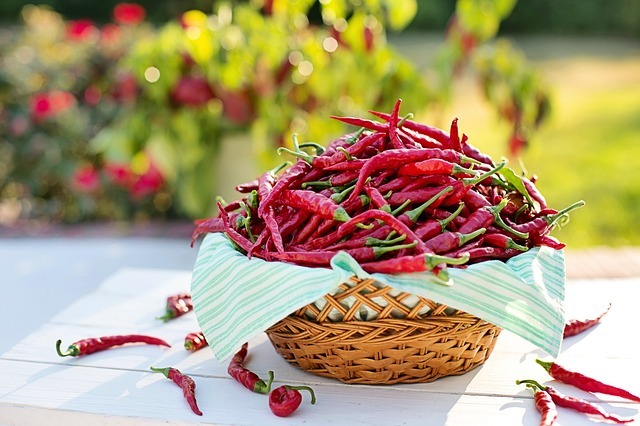 Cayenne comes from the Capsicum genus that also includes bell peppers, chilies, paprikas and habaneros. This genus is from the Americas and has been cultivated for use for at least 7,000 years. Some of the early european explorers brought the seeds from South America back to Europe and they quickly spread around the world. The etymology of the word Capsicum is believed to have been derived from Greek, meaning “to bite”. Cayenne has a hot and acrid taste. This “bite” or heat is caused by the constituent capsaicin. The more capsaicin a pepper has the more heat or bite to it. This amount varies greatly between species and varieties. One method of measuring this bite or heat is the Scoville heat units (SHU). Cayenne has around 30,000 – 50,000 SHU. In contrast, bell peppers have 0 and habaneros have more than 100,000. Cayenne is famous for reducing many types of pain. It works by effecting your nervous system. Substance P is a neurotransmitter that relays information and results in what we call pain. Capsaicin, a major constituent of cayenne peppers, blocks substance P and therefore reduces pain. When cayenne is used topically it can relieve many different types of pain, from diabetic neuropathy, shingles, migraine headaches, back aches, arthritis, menstrual cramps and bruises. Today’s recipe is a super simple salve that can be made up very quickly and bring big-time pain relief. Two heaping teaspoons of cayenne powder (or 15 grams). Begin by infusing the cayenne into the olive oil over a double burner. I heat the oil and cayenne until it is warm, turn off the heat and let it sit (warmly) for about 20 minutes, then turn the heat on again. I do this for at least one hour to a couple of hours, you could do it for 24 hours if desired. Once the cayenne and olive oil have been infused, strain off the powder through a cheesecloth. Reserve the infused oil. Heat the beeswax until it is melted. Stir in the infused oil until the beeswax and oil have been thoroughly melted together and combined. Immediately pour this mixture into jars or tins. (Makes roughly 4 ounces). Let it cool and then label it. This cayenne salve can be used on aches and pains, from sore muscles and joints to bruises and even nerve pain. It is best for closed wounds and may sting a bit on open wounds. Even on closed skin you may feel a bit of burning or heat in the area where it is used. It should be applied externally only and used within 6 months for the best results. If using it for arthritic pain it may take up to a week or two to see results. In this case you want to use it daily to decrease chronic pain. Caution: When cayenne comes in contact with your mucosal membranes or eyes it will burn! Be sure to wash your hands thoroughly after touching cayenne or use gloves to apply the salve to the desired area. If you are using the cayenne salve on your hands, consider applying it at night and then sleeping with gloves on.